Shooting in FIFA 10 isn't much different from previous FIFA versions, but there are a few small differences. One thing you may notice is that shots actually drop normally, in FIFA 09 they seemingly never stopped rising. Overall though, shots are a bit easier to pull off when compared to earlier versions, but not by much. The traditional laces strike is the default shot in FIFA 10. By pressing the default shoot button for your particular gaming console, the player will execute this shot. More powerful than the chip or finesse shots, but they are much less predictable and sometimes less accurate due to how quickly the power bar can fill up. I recommend this shot if you are shooting from relative distance (18+ yards out) because while in the box, the finesse shot will be more useful in most cases. The regular laces shot is more useful in the box in some scenarios such as a right footed shooter aiming for the wide left post while approaching from the right side of the goal. Of course, this isn't the only scenario, but you will have to experiment to figure out what works when deciding between regular shots and finesse shots, which are explained below. Finesse shots are sidefooted strikes which are particularly useful when shooting from in and around the penalty box. Finesse shots are generally more accurate than regular shots, but will be much less powerful. Finesse shots also have a decent bit of curve, the amount depending on the strength of shot and time it has to curve. To execute a finesse shot on Xbox 360, hold down RB while shooting, and R1 while shooting on PS3. Chip shots are useful shots which are used to cheekily loop the ball over the goalkeeper and into the goal. A chip shot has a high arc and is not very powerful, but is useful for when the goalkeeper is not on his line and a bit farther away from the goal than he should be. This scenario occurs a lot when a player is on a breakaway and the opponent rushes his goalkeeper out too early, giving you enough time to chip it over him before he gets too close to cut off your angle. Sometimes in FIFA 10, goalkeepers are off their line for no good reason, so you should look for this and give it a try if he is. On Xbox 360, chip shots are executed by holding down LB as you are pressing the shoot button, and likewise for PS3 although you want to hold down the L1 button instead. Volleys are shots taken while the ball is airborne, making it much harder to get on target, but they look spectacular when you do so and it results in a goal. Volleys tend to be much harder than ground shots, both in real life and in FIFA. The control for a volley is the same as a regular shot on your console. Keep in mind that the volley category includes any airborne shot except for the header, so look out for opportunities to pull off an acrobatic shot such as a bicycle kick, which occur randomly and you cannot do much to increase the chances of them happening. There isn't much to say about headers as shots. The control is the same as what it is for a regular shot for your console. Remember that a good header is usually accompanied by a good cross, so if you don't provide good crosses in from the wings, don't expect good headers. Crossing situations aren't the only ones that provide heading opportunities, but keep this in mind. When thinking about taking a shot, keep in mind the position of your player in relation to the goal. Also think about how the ball and your player are moving and how this will affect your shot. An example of an ideal time to shoot is when your player has enough room for a decent run-up, not pressured by opposing players, and the ball is on the ground and not moving fast. 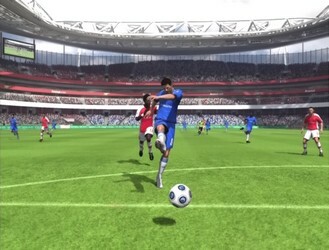 By default, FIFA 10 is set to assisted shooting. This means that whenever you take a shot, the computer ultimately directs the shot and determines its power for you in relation to where you “sorta” directed the shot and how long you held the stick for. Once you set your shooting settings to manual, you will realize just how much the computer helps you get your shots on target. When you first set manual settings, don't be discouraged by how your shots go everywhere but into the net. You will improve over time and in the end it will be worth it as your shots will be determined 100% by your command. This means that once you get good, you can hit the far corners out of the keepers reach much more frequently than if you'd spent the same amount of time practicing shooting with assisted settings. See more on the Assisted vs. Manual debate here.